If you haven’t heard of Houzz, it is a home décor trends website that offers lots of great information for people styling and renovating their home. They have just released their 2017 Kitchen Trends Study which includes lots of information gleaned from users of their website who have completed a kitchen renovation within the last 12 months, are in the process of one or are planning one in the next 6 months. For kitchen cabinets, 31% of new kitchens were white, 27% were grey and 9% were beige – looks like most people are staying pretty neutral in 2017! For kitchen worktops, 24% went for engineered quartz, 20% went for granite and 17% opted for laminate. The most popular colours were white (27%), grey (17%) and black (15%). For flooring, 30% chose a ceramic tile, 16% went for wood and 16% stone. On walls, 84% stuck with a traditional paint finish. 22% chose wall tiles and 9% chose a trendy exposed brick finish. 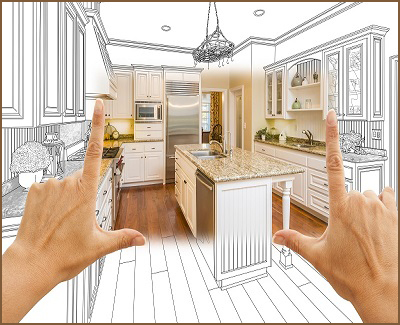 In terms of spatial planning, 32% of kitchens surveyed were U shaped, 28% L shaped and 14% galley kitchens. Built in features proved popular with 42% incorporating an island unit, 40% a pantry cupboard, 34% a breakfast bar and 29% a built in wine fridge for perfectly chilled Pinot Grigio no doubt! 24% included a built in hot water tap so no more waiting for the kettle to boil for them. Overwhelmingly, 56% described their style of kitchen as contemporary. 10% stated traditional, 7% country, 6% Scandinavian, 4% thought theirs was ‘eclectic’ and 4% described theirs as industrial. Storage was a big issue with many citing it as among their key objectives for upgrading their kitchen. 79% said they wanted to make better use of space. 57% wanted to reduce clutter. 55% wanted to make it easier to locate items. 36% wanted to utilise unreachable space and 21% wanted to create a better space for cooking and/or baking. This is just a snapshot of the report and we’ll be going into aspects of it in more detail in future posts. Much of this does back up what we are seeing customers look for, although we do get requests for colour outside of the white, grey and beige that seem to dominate this report. If you’re looking for ideas for your new kitchen project then why not book a free design consultation with us? You can request one by calling 0800 321 3491 or complete our request form. 0 Responses to "Houzz Kitchen Trends Report"